And perhaps the sector that truly embraces this adage is digital marketing; particularly SEO.SEO practices have been undergoing extensive updates and changes over the years and continue to do so even today. These changes, generally by search engines like Google, have helped the world of digital marketing become better, more efficient and increasingly reliable by keeping up to date with the changing times and trends. 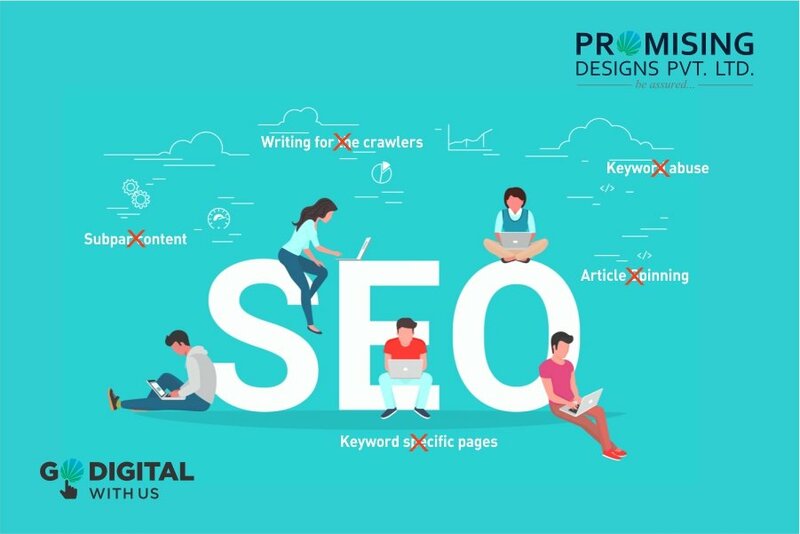 However, many digital marketing firms in Pune still cling to the old, outdated SEO practices in their journey towards establishing a strong digital presence. Now while these practices may have proved useful in the past, due to the rapidly changing trends in the digital world, may no longer be as effective. Holding on to these practices of days past may not just be ineffective but also potentially dangerous to the brand, websites, and overall digital well being. It's time to let go of the past. It's time to update! Keyword stuffing: Loading up web pages with keywords, often to the point where the content stops making any sense due to the unnatural combinations of the keywords. Keyword density: Using specific keywords multiple times in the same content, thus increasing the density of keywords but losing out on the quality of the content. Irrelevant keywords: Using keywords that are not in line with the content on the page and do not convey any clear message to the reader. Again, bombarding the web page with keywords and their variations may have worked in the past, but the search engines have stepped up their game since then. Search engine crawlers today are sufficiently advanced to recognize a pattern of repeated keywords and their variations, as well as the context in which they are being used. This means the crawlers are actually able to recognize and identify bad or irrelevant content. So instead of packing on the keywords for the crawlers, write quality and informative content for the human readers on the other side of the screen. One of the old SEO tricks involved article spinning, which is exactly what it sounds like. Using software, marketers would try to rewrite relevant and quality content using alternate words, phrases and keywords. What this usually produced was a messy version of the same article that had been recreated with the same basic message. This is yet another reason why human generated content is so much more effective, informative and helpful unlike a piece of content wrangled out of software. Once a useful tactic for ranking, creating separate pages for different variations of the same keyword finds itself obsolete in light of recent algorithm updates like Hummingbird which help search engines realize that the variations of one keyword all basically explain the same thing. Creating separate pages for the variations of a single keyword is counterproductive because it compromises on something that is of utmost value for readers in today's digital age - the user friendliness of the site. Having to navigate hoards of pages which basically all say the same thing is tedious to say the least and the readers will soon tire of having to wade through a sea of information with no shore in sight. Additionally, the algorithm updates help Google understand when this tactic is being used and thus overlooks the content. Instead of focusing on numerous pages with the same information, focus on creating web pages with quality and helpful content with the sufficient density of keywords required to attract (and keep) the attention of the readers. Yes, there was a time when bad content would still have racked up rankings. But that's a thing of the past. No more can we hope to scrape by the watchful eyes of crawlers with irrelevant, keyword stuffed or even stolen content. The search engines have grown and updated and educated themselves on how to distinguish quality content from the riff raff and treat the content as such. So write informative, rich and value content for your readers and the search engines will reward you appropriately - with ratings unbound. 'Tis the time to bid adieu to the ghost of SEO practices past and ring in the New Year with a brilliant, up to date and value adding SEO strategy.